Inventek announces Microsoft Azure cloud support with STM32L4 Discovery IoT kit using the Inventek ISM43362-M3G-L44 802.11 b/g/n compliant Wi-Fi® module. This eS-WiFi module utilizes Inventek firmware, IWIN C3.5.2.x_SPI_STM. The IoT Discovery kit has been qualified for connection to Azure cloud. 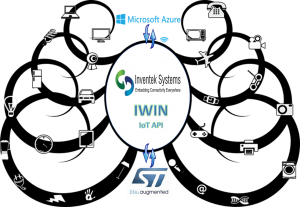 Inventek and ST Microelectronic s has developed this project to allow OEM’s to quickly integrate Wi-Fi over a SPI host interface running the MQTT protocol. The STM32L4 Discovery Board for IoT with the ISM43362-M3G Wi-Fi module can be purchased from Digi-key , P/N B-L475E-IOT01A. The Cube project for Azure, is an STM32Cube function pack that was developed for this kit and it can be downloaded here, FP-CLD-AZURE1. With this IoT evaluation board, you can connect to Azure IoT Hub the cloud platform, monitor, and manage billions of IoT assets using one of the Microsoft Azure. The STM32 IoT Discovery Kit Node is an Arm® Cortex®-M4-core-based developer kit and supports a full set of low power wireless connectivity options and environmental, motion and ranging sensors. Azure IoT C SDK is integrated into the middleware of this function pack, which enables direct and secure connectivity to Azure IoT Hub, as well as full support for Azure device management. Furthermore, the platform specific adaptors which plug into the C SDK are available in source code. Developers can leverage this port across different MCU families using the hardware abstraction layer and STM32Cube. The STM32L4 Discovery kit for the IoT node (B-L475E-IOT01A) allows users to develop applications with direct connection to cloud servers. The STM32L4 Discovery kit enables a wide diversity of applications by exploiting low-power multilink communication (BLE, Sub- GHz), multiway sensing (detection, environmental awareness) and ARM® Cortex®-M4 core-based STM32L4 Series features. Arduino™ Uno V3 and PMOD connectivity provide unlimited expansion capabilities with a large choice of specialized add-on boards.